Followers of my Instagram account – @thejerseypocket – may have noticed a recurring feature popping up in recent pictures of me.. I’ve been rather taken by Velocast’s Lego cyclists T-shirts and have been slowly assembling the full set of the old-school racers. Having a couple of young children who are big fans of both cycling and the ubiquitous Danish plastic blocks has made this collection a little easier to explain away but the truth is that the majority of the riders whom Velocast have chosen to re-immortalise are the self-same heroes that I was watching whilst still mucking about with Lego in the first place – so the match-up is very apt. Tom Simpson in classic black and white Peugeot kit; Eddy Merckx in the brilliant black and orange of Molteni; the young peloton-destroying ‘Professeur’ Fignon in the furiously slanting lines of Renault-Elf; Hinault and Lemond locked together in their famous tussle for control of the Mondrianesque La Vie Claire; and, of course, Robert Millar (complete with ponytail) resplendent in the Z-Vêtements jersey that, for me at least, marked the end of the classic cycling era. The range goes a bit further with Taylor Phinney and Marianne Vos but it’s the old school guys that really took my fancy. It’s hard to pick a favourite. I like the Hinault/Lemond double because it tells a story but I wear Eddy the most. The slightly smaller-sized figure on the jersey works better I think, and as Eddy won practically everything else it seems right he should win this little battle too. The T-shirts are available at the velocast.cc shop priced £25. A uncompromising winning machine, Eddy Merckx bestrides professional cycling as an unassailable colossus. His palmares is without compare, his dedication to victory without parallel. 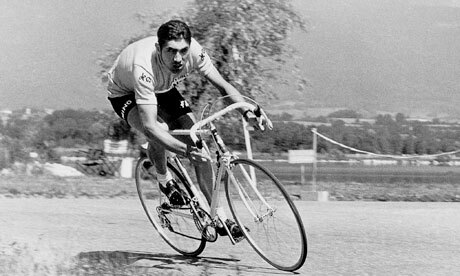 Quite simply The Greatest of All Time, Merckx has no match; modern, historical or contemporary. On every surface, in every season, over every distance, across every parcours, Eddy was, is and will always remain the man to beat.